So the next incarnation of the iPad will be launched next week and already husband and I are fighting over it. Theoretically, there is no fight because a) I win, and b) the product isn’t even out yet, and c) there is a possibility that we will not buy it. But just for the record, here’s how the conversation usually goes. He: iPad 2 is coming out! Me: Yeah, I know. It’s going to be lighter, right? He: Yeah. Who’s going to use it, you or me? Me: Because it’s going to be lighter! Surely you wouldn’t want me to lug around the heavier iPad when you are holding on to the lighter one? Jokes aside, I have a feeling that a second iPad will be joining our very large and very happy Apple family. Call it my sixth sense. Ever since we were gifted with the Paddy (very original, I know), it’s really changed the way I use the computer. Back in the pre-Paddy days, I would automatically gravitate to my computer immediately after dinner. I subscribe to quite a healthy list of blogs and my evenings are spent reading these. These days, my poor Ingrid (yes, I name my gadgets!) has been sadly neglected. I now only use it if I want to edit my photos or blog. Most times, I’ll surf on the iPad or read one of my many e-books. One of the reasons could also be the change in my reading habits. I’ve stopped following the blogs on my RSS feed religiously and have gone back to books. I don’t know which came first, it’s like the chicken and egg debate: did I buy the iPad and renew my love for books (thanks to the e-books husband got for me) or did my tastes change and I naturally gravitate towards the iPad? Whatever the reason, the iPad hardly leaves my hands these days. A lighter iPad would be handy because, come on, holding it up to read on the train can definitely build some serious arm muscles. We’ve been tossing back and forth on the idea of selling our laptops and realigning our techie stuff (SO BUSINESS!) so we’ll see. Warning: this is a geekoid post. When August 22 arrived, neither Mr Thick nor I bought the iPhone. Oh, it’s not that we did not want the slick piece of perfection to come into these willing arms. Being StarHub users, we (rather, he) were not keen to let go of our phone-internet-cable TV Hub package and move over to the red camp. To be perfectly honest, I was more than happy to switch operators; afterall, I had deliberately not re-contract with Sparky’s owners just for the iPhone. The other reason was due to the fact that the data plans offered by Singtel were not enticing at all and I was not interested in doubling the cost of my price plans just for that sad 1GB of data. I was literally dying inside to buy the phone. I grabbed onto Trevor’s Froth every chance I could get, cooing over his Rabbid themes with adoration. Yes, I was that sick. We contemplated buying the phone without a contract but stingy ‘ol me refused to pay $1k for a phone, even though it is the Jesus phone. The answer came to us late last year: his friend, who is a Singtel customer, wanted a HTC phone (??) that was only available on StarHub and was willing to trade. With me! Hurrah! Poor Mr Thick is still under contract so the deal fell onto my all-too-willing lap. And that’s how Isabella iPhone came into my world last month. It’s been a wonderful experience and the iPhone is so easy to use that I didn’t have the usual teething problems I had faced when reviewing crap Korean and Finnish phones. Of course, there were some missing functions that I used to get from my trusty Sony Ericsson – 3G video calls, MMS, copy and paste, Bluetooth, message forwarding – but so far, none of these have hindered me greatly. The best thing is, Isabella (she’s in pink!) has become more than a phone to me – I can now write blog posts while on the MRT and email it to myself when I get home, I can watch videos on a larger screen as compared to my StaRPod ver2.0, I can tweet (!) whenever I feel like it, I can take pictures and upload them immediately onto my Flickr account…you get the drift. Thanks to Popartgirl’s generosity, I was gifted with a US$25 gift card for my birthday and the first purchase of the day was Sally’s Salon, a disgustingly addictive game that kept me up till 3am. With the card, I now have an US account (which is much more comprehensive than the sad local platform offered to us by Apple) and have been buying tunes (Ingrid Michaelson’s live rendition of Creep is pure awesomeness), apps and games with glee. Yums. 1. Sally’s Salon (US$0.99) – It’s similar to the old Nintendo game that I used to play, where you have to run to each bar aisle and catch the empty beer mugs that patrons discard. Except this time, you are facing a horde of disgruntled customers who want to do their hair, nails and tan and they want it NOW. 2. Saturday Night Fever (free!) – I love the cool graphics and retro music! You tap and glide your fingers according to the beat amid a backdrop featuring a dancing man with a bouffant hairdo that can rival Kim Jong-Il. 3. Polarizer (free!) – Turn the photos that you take into Polaroids. Most of the pictures taken in previous posts have been processed by the Polarizer. I love the effect! 4. NYTimes (free!) – When I am lazy in the morning and refuse to get out of bed, I switch on Isabella’s wifi and read the news with my head on my pillow. 5. Style.com (free!) – Get all the fashion news from Style.com while on the go! 6. Tweetie (US$2.99) – Read everyone’s tweets in a user-friendly format. Posting pictures was a bit of a pain, though, and it took me three tries before it was uploaded successfully. 7. Facebook (free!) – I swear it, I am addicted to Facebook and update my status at least once a day. 8. SG Wireless (free!) – Sign on to the dreadfully temperamental and laggy Wireless@SG with just a tap. That reminds me, I gotta get my password sorted out and stop filching Mr Thick’s account. 9. NetNewsWire (free!) – See NYTimes. I live in my bed. 10. Darkslide (free!) – Take pictures and upload to your Flickr account. 11. Tap Tap Revenge (free!) – Relive your para para days and tap your fingers to the music! The best part is, you can download free tunes to update the playlist. 12. AllRecipes (free!) – I haven’t really tried any of the recipes but I really like the DinnerSpinner feature. The users’ feedback offers different ways of updating and improving the recipes. I am not sure if there has always been a closet geek hiding inside my little body, which was gleefully unlocked out of its sad existence by the boyfriend, or was it a case of his gadgety influences rubbing on me. Two months ago, I finally caved and ordered myself a MacBook to prepare for the seemingly eventual demise of my beloved Baby-iMac G4 (happy sixth birthday!). Poor Baby has been having a hard time waking up from its sleep mode – it has a penchant of clicking its hard disk in resentment from having to rise from its hibernation. Furthermore, it loves to hang on me upon waking up. Egged on by the boyfriend, who was himself eyeing a MacBook Pro (his Quiksilver is older than Baby), we decided to splash some cash on new machines. On a bluesy Monday night, the boyf brought Ingrid into my home and what can I say, it was love at first chime. Leopard (OS 10.5) rocks! I wasn’t able to install it on Baby because, well, it would probably fry its 700Mhz processor and puny 786MB RAM. But ooh, on Ingrid’s 2.4Ghz processor and 2GB RAM (it’s going up to 4GB soon, I promise), everything flowed fast and smooth. No more waiting for ages to load a picture in Photoshop. Hurray to shooting and editing in RAW! I still love Baby though, I haven’t forsaken it completely. It now is my media machine and occasionally when I hanker for a bigger 15-inch screen (don’t talk to me about resolution), I still use it for basic surfing. Ingrid and Baby sit side by side everyday in their pristine whiteness (or as white as Baby can be anyway, after six years) and we have plans to keep it in the east end for use as a photo/music machine. And let’s not forget TheBund – the boyf’s swanky new MacBook Pro (the backlit keyboard is gorgeous!). He took it over to my house on the day he received it and being the ultimate geek that he is, he decided to make a stop motion video of its unveiling. TheBund and Ingrid got along very well – as you can see in the movie – and it really was a blast unwrapping the sleek machine (check out the video below, it’s awesome!). We’re going to be such a household of Apple freaks (two laptops, two desktops, five iPods and possibly two iPhones) and gadgety geeks. This is my new iPod. She is an iPod Shuffle. She is very wee, very cute and very gorgeous. She is an early Christmas present from a very generous cousin. 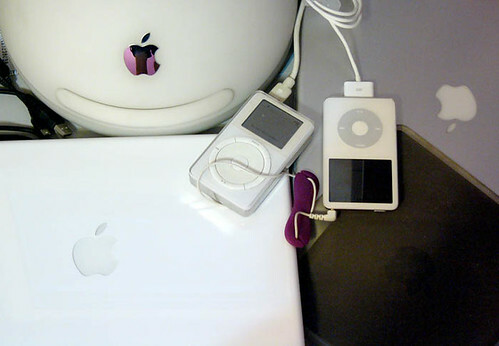 She is the third iPod in my Happy Apple Family – StaRPod (1st Gen, 5GB) and StaRPod ver2.0 (5th Gen, 30GB). I love my Wee StaRPod. That sums me up right now. I haven’t had much energy and time to write these days, after work and gym. Plus, this thing called Wii (thanks to Bralala!) has been occupying my time, making blogging a secondary activity. BUT. That’s not why I am writing. The main point is, I have played with the new iMac and I. Bloody. Love. It. 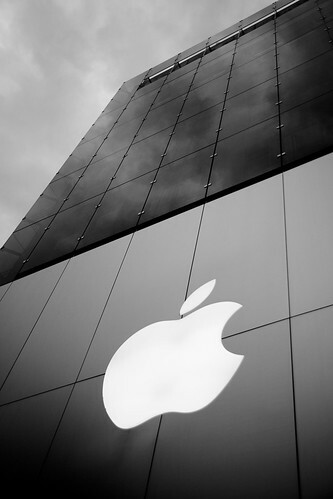 I attended the Apple briefing today (9 days after the main event, it’s almost sacrilegious) and it was just so awesome. 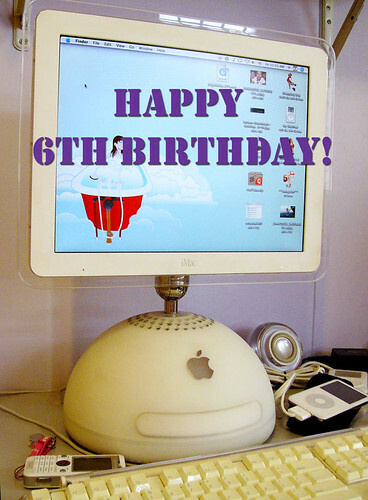 The iMac was all metallic sexiness, with its slender form and sleek aluminium lines. It’s like how the cute boy-next-door wearing braces has turned into this hunk of a man with delectable abs and yummy biceps, sans braces. The glossy glass screen does reflect light and was a little disconcerting but the images were truly lifelike and vivid. I can’t wait to get me one. Typing on the new keyboard felt a bit weird initially. Afterall, it’s as slim as a pancake and retains none of the clacking noises that I have grown so used to. It’s surprisingly tactile and easy to use despite its gorgeous form. Some of the keys have changed positions and Expose and Dashboard now have their own dedicated keys. iLife is really, really cool. I love the “skimming” tool in iPhoto and iMovie. Basically, mousing over a set of events or a clip allows you to view all the different images and frames within. The new way of managing pictures via Events in iPhoto makes it easier for shutterbugs and it definitely looks less clunky than before. Even iWork looks interesting. Newcomer Numbers makes spreadsheets look funky – you can now place two tables into one spreadsheet and make adjustments to one without affecting the other. Plus, you can also add pictures and sounds to your spreadsheets. Spreadsheets, good looking? Who would have thought?